Photo by Bill Ingalls/NASA via Getty Images. Maria Butina, the alleged Russian agent arrested by the FBI last week, is said to have attended the National Prayer Breakfast in order to cultivate Republican officials. But Butina is far from the religious group’s only questionable association. The organization that runs the National Prayer Breakfast, the Fellowship Foundation, sent Rep. Robert Aderholt (R-Ala.) to Romania in May of last year to meet with an infamous anti-Semitic political operative, Marian Munteanu, according to federal travel disclosure records. Once there, Aderholt met with Munteanu on two separate occasions. Other travel records show they met in May of 2015 as well, again at the behest of the organization. The purpose of the trips was to “build new and maintain old relationships with business leaders and officials from throughout the region,” according to the travel records. The relationship that the Fellowship Foundation has with Munteanu doesn’t seem to be limited to Aderholt. Last year, Munteanu said in a post on his Facebook page that the Fellowship Foundation’s founder, Doug Coe, was a “close friend.” Also, Munteanu’s personal website includes a photo of him with Coe. 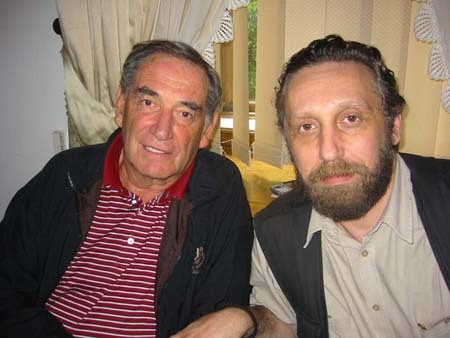 FELLOWSHIP FOUNDATION FOUNDER DOUGLAS COE WITH MARIAN MUNTEANU. PHOTO VIA MARIAN MUNTEANU’S PERSONAL WEBSITE, MUNTEANU.RO. Coe passed away last year. Munteanu attended last year’s National Prayer Breakfast in Washington, according to a Romanian report quoting Munteanu’s Facebook page. The report does not identify who invited him. Neither the Fellowship Foundation nor Aderholt responded to multiple requests for comment. The Fellowship Foundation is a Christian group that counts top business and political leaders among its ranks. It is also famously secretive; its members take a vow of silence about Fellowship activities. Last week, TYT reported that the Fellowship sent Aderholt to several eastern European countries shortly after Donald Trump won the Republican primary. TYT also reported that the Fellowship, along with its Ukrainian affiliate, sent at least four Republican members of Congress to various eastern European countries, where they worked with political advocates of anti-LGBT policies which could jeopardize E.U. membership. In April of 2016, Munteanu criticized a law against anti-Semitic speech and Holocaust denial, saying there is hardly any anti-Semitism in Romania, according to a report in the Jerusalem Post citing the Romanian newspaper, Evenimentul Zilei. The Jerusalem Post also cited a report in Romania’s national news agency, Agerpres, that The Elie Wiesel National Institute for the Study of Holocaust said Munteanu “presents a concern” for statements “minimizing or denying” the Holocaust. On May 29, 2017, Aderholt’s originally planned itinerary describes a lunch with Munteanu for the purpose of “Catching up on spiritual and personal lives and current events.” The day prior, Aderholt attended a dinner with Munteanu. The original itinerary noted it as “Dinner with long term friends” and listed Munteanu as a host. PLANNED ITINERARY FOR REP. ROBERT ADERHOLT’S 2017 EASTERN EUROPEAN TRIP SPONSORED BY THE FELLOWSHIP FOUNDATION. In May of 2015, Aderholt’s itinerary shows plans to dine with Munteanu and his wife. Munteanu was not the only figure of controversy with whom Aderholt met during his 2017 trip. Aderholt also met with a number of scandal-plagued political and business elites. On May 29, 2017, Aderholt met with the Prime Minister of Romania, Sorin Grindeanu, whose ministership would end up lasting all of five months. Several months prior, Romania had been rocked by the largest protests in decades in response to a decree issued by Grindeanu that decriminalized certain forms of corruption, protecting dozens of politicians from prosecution. Less than one month after Aderholt’s visit, Grindeanu was forced out by an overwhelming vote of no confidence—241 to 10. On three separate occasions, from May 27 to 29 of 2016, Aderholt met with former defense minister of Albania, Fatmir Mediu. Like Grindeanu, Mediu’s government role came to an abrupt end: He resigned in 2008 after an arms dump he was in charge of accidentally exploded, raining shells on nearby villages, killing 16 people, injuring almost 300, and destroying homes. Later in 2008, a U.S. envoy accused Mediu of covering up an illegal arms deal. Albania’s prosecuting general also reportedly launched an investigation into Mediu’s personal finances, citing discrepancies. On May 27, 2016, Aderholt met with Nenad Popovic, the pro-Russia president of the Serbian People’s Party. Popovic, who is said to be Serbia’s wealthiest politician, was reportedly implicated in the Paradise Papers leak. The documents reportedly show Popovic relying on offshore tax havens to stash his wealth.